On the eve of Nov. 17, while much of the Harvard community is gearing up for “The Game” against Yale, a handful of law school students will be prepping to play a very different sort of game against the same rival. That night, members of the Harvard Law School (HLS) chapter of the Global Poker Strategic Thinking Society (GPSTS) will challenge the society’s Yale chapter in a poker tournament. Founded by Weld Professor of Law Charles R. Nesson ’60, GPSTS aims to “create an open online curriculum centered on poker that will draw the brightest minds together,” according to the group’s online statement. The GPSTS currently has chapters organized at Stanford, UCLA, and Brown, in addition to Harvard and Yale. Nesson and third-year law student Andrew M. Woods, the interim president of the HLS chapter, said that the group hoped to change the reputation of poker from one of illegal gambling to that of a valuable educational tool. “Poker teaches cognitive ability in a way we just don’t have in education now,” Woods said yesterday afternoon. While the group is not allowed to gamble during meetings, they spent their first meeting on Tuesday night discussing some of the finer points of the card game. “Anybody that somehow thinks interest in poker is a bad thing would be convinced just by seeing and listening to these kids talk,” said Nesson. Woods said that the GPSTS would host several events open to the Harvard community over the semester. A panel discussion with poker champions Howard Lederer and Crandell Addington is expected to be held on Oct. 15. The group plans to hold a discussion on the dispute over online poker and a day-long conference on the educational value of poker in November. The GPSTS also plans to launch a National Collegiate Poker Tournament in March. “It will hope to capture the same spirit of the March Madness basketball tournament,” Woods said. 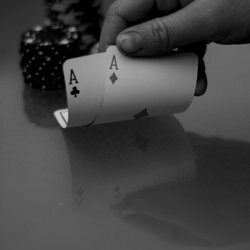 The debate over the legality of poker focuses on whether it is a game of chance or a game of skill. To study the dispute, GPSTS organizers said they plan to use duplicate poker decks, setting a deck up in the same way at ten different tables. This means that players are not only competing among the others at their table but also with their counterparts with the same hands at other tables. “It’s a good way of really demonstrating and determining who has the most skill in a game,” Woods said. While a Harvard undergraduate chapter of GPSTS does not yet exist, two students—Brian M. Wan ’08 and Jason A. Caloras ’08—are in the process of creating one. “What we’re going to be doing is trying to help legitimize poker,” said Wan.